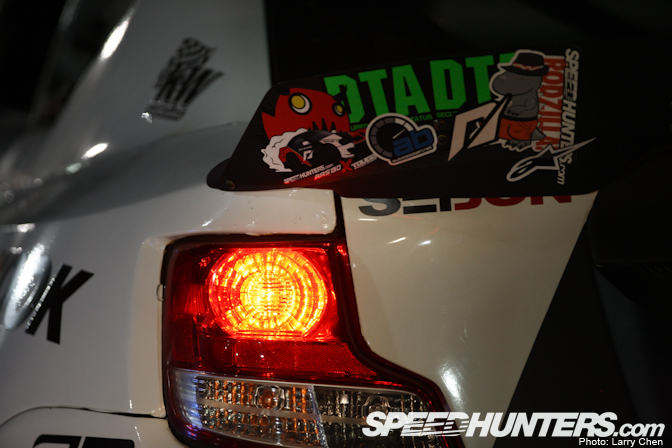 Hello Speedhunters! I know there are many blogs coming from me right now, but please bear with me…. 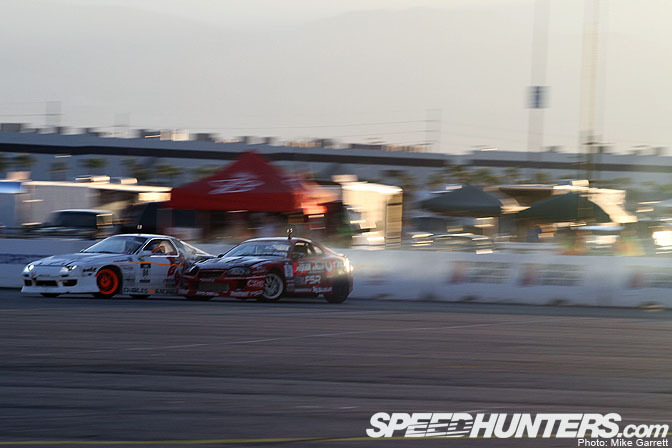 I will go slightly more technical than before as I take you through round 6 of the 2011 Formula Drift series: After Dark at Las Vegas Motor Speedway. Thanks to amazing help from my spotter Steffen and FSR Motorsport Creations, I was lucky enough to get to drive the Las Vegas round last year. Unfortunately, I returned the favor by shortening the Supra by a couple of feet after hitting the second outer clip wall dead on. 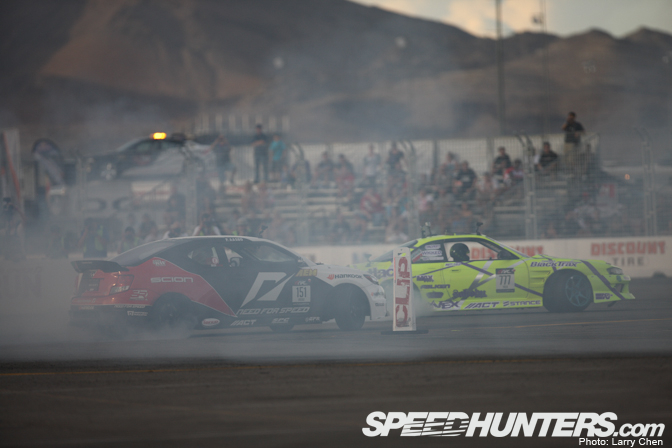 Then, we set the fuel tank on fire, before I took both Charles Ng and myself off track in Top 32. If you look at it from an entertainment point of view, I guess it was a good outcome. If you want to move on in the competition, however? Then it’s not the way to do it. So as we arrived in Vegas, I wondered what would happen this year. As cliche as it sounds, my past trips to Vegas has involved some gambling of different sorts, and I haven’t even been near a slot machine! In an effort to help forward bite the tC now sported a new duckbill wing. The base of this wing is the stock OEM option tC spoiler, but it now has an additional screw-on stock car style aluminum lip. It’s a beautiful creation hand crafted by Len at Papadakis Racing. say it looks the part too –yeah? Another not so apparent change was 150 lbs of lead ballast atop the rear axle. 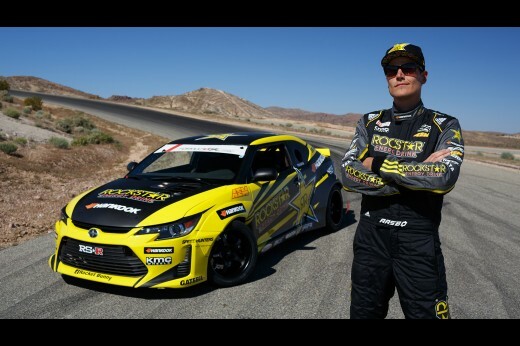 We wanted to run our previous tire sizing to help grip (in Seattle we ran a smaller tire), but due to the changes in Formula Drift’s tire width to weight regulations that came in effect in Seattle we were required to add weight to the car. 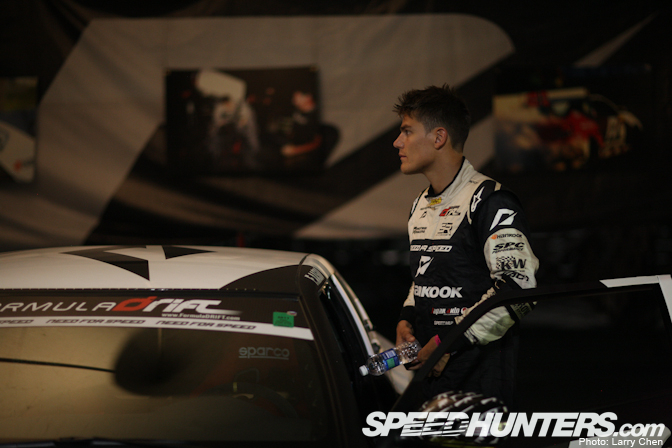 … and it certainly made for some pretty cool shots as the car squatted on throttle! However, it wasn’t all golden. The car felt very strange on lock and I had to be real gentle as I approached the first inner clip to avoid it coming round on me. We checked over a couple of settings and raised the rear slightly as we saw it bottoming out over the bumpy first sections of the track. We put our combined experience on the line to work it out but couldn’t get around the issue. In hindsight, it seemed clear that we needed to work with the ballast in a different way. For instance, going down on tire sizing and dropping the ballast wasn’t an option at the time. However, it will be now as we gear up for Irwindale! I headed back out and tried as hard as I could still retaining a little bit of margin at the unforgiving Vegas course, which would later take quite a few victims. As a driver, I live for these moments when things aren’t smooth sailing and it’s all on the line! That’s when it’s down to the core and nothing else matters. 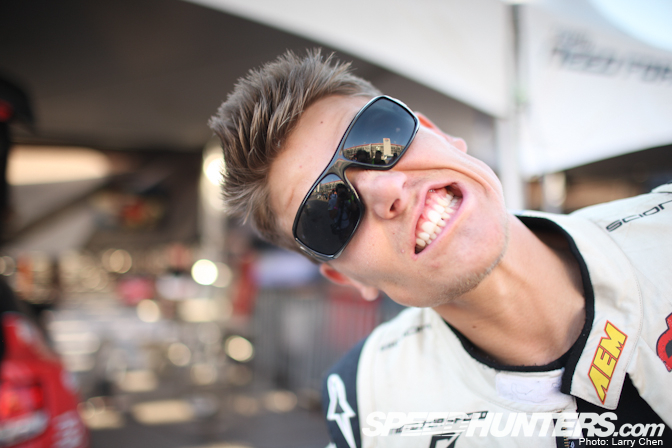 Friday and qualification day came around, and with the insane heat in Las Vegas (approx. 110? Fahrenheit or 45?Celsius) in car temperatures go through the roof. The solution? A cool shirt system! This is an ice filled in car cooler unit that pumps cold water through the “veins” of a special shirt. And the result? A cool Fredric. Maybe too cool there, hot shot. I don’t know what went on here! And I don’t know what went on here either. All I have to say is that I am terrible at planking and I don’t think Andy Luk’s entrance was planned for, haha! It still feels awkward signing pictures of myself and get catered to by all these great people, like Miki who hands me a chilled NFS water bootle. Thanks Miki! Some people ask me how I am “always” in a good mood (although I have my moments too!). It’s actually very easy. Do I have anything to complain about? Absolutely not! Back in the pits I got to test The Run for the first time! I got a presentation of the game when I visited EA’s headquarters in Vancouver in February and had been looking forward to testing the game ever since. It’s more of an arcade game than SHIFT 2: Unleashed, and is the ultimate dream for anyone that aspire to do racing like Gumball, Cannonball and the likes. The Run is fast paced and high stakes all the way, just like Las Vegas! By the way, the Aloha Lei around Dmac’s neck was a gift from me (after I found it on the ground…). As I did not feel quite at home, I decided to go through qualifying a little conservatively. 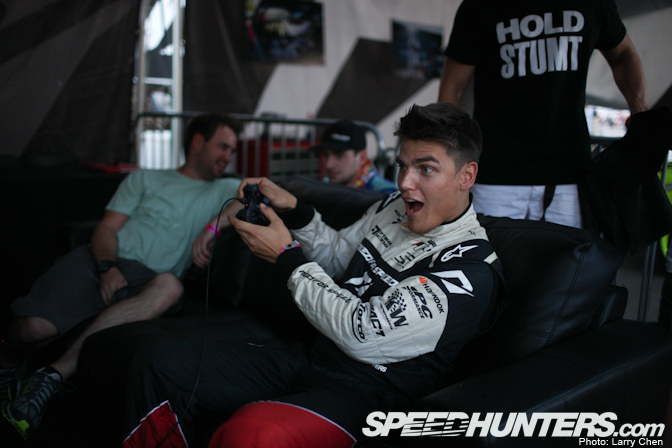 However, reaching the two speed thresholds is key and I shot in there as fast as I dared! …and shot for a fast, clean line through the infield. We qualified in the middle of the pack and were in for the main show! YES! Next up was the top 32 Friday night practice. We got some good runs in and it was great fun! But halfway through the session, the motor started running rough. Upon inspection back in the pits, it turned out compression was down and we had a couple of bent valves… a serious issue by any means. But Shawn, Aldo and Steph pulled out the spare motor from the trailer, and swapped it in the next morning. Just like that! These guys are true legends and work around issues like this in a remarkably calm way. Much respect!! The cause of the issue was still not clear and we backed off slightly on various parameters of the tune to avoid the same thing from happening again. Fast forward, and we jump straight into Saturday’s top 32 battles. I was up against Matt Field. 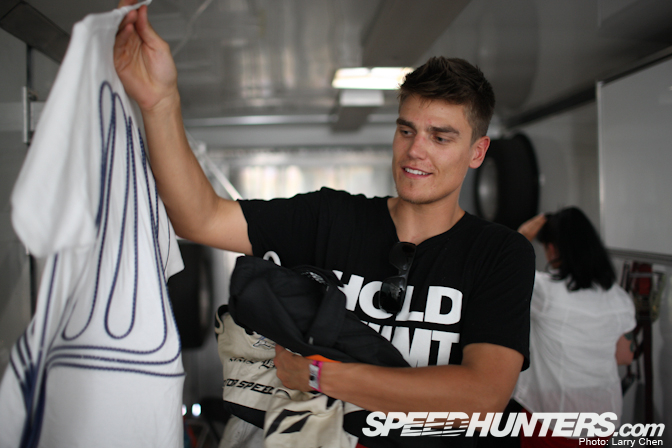 He is one of the upcoming rookies from last year and has a very inspiring drive to go drifting – keep it up, Matt!! 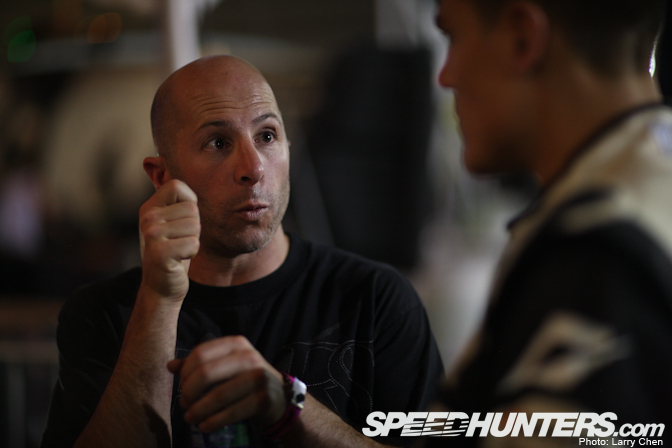 He runs a well setup LS based S14 with drop knuckles and I knew he had been on fire all weekend! Steffen and I had decided that I would keep some distance at the entry as he ran slightly different lines in practice and we didn’t want to get locked in on a shallow line. Matt flicked it in backwards and it was absolutely amazing to chase his entry! However, he then shot in to the infield going shallow approaching the first inner clip. I took a slightly wider line, which was the better choice both line wise as well as speed wise as it set me up well for the rest of the course. 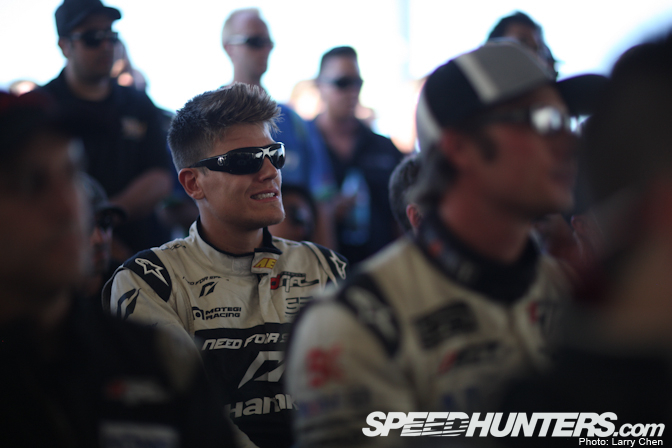 Matt has a lot of speed dialed in to his car and I focused on staying on him more than anything else. 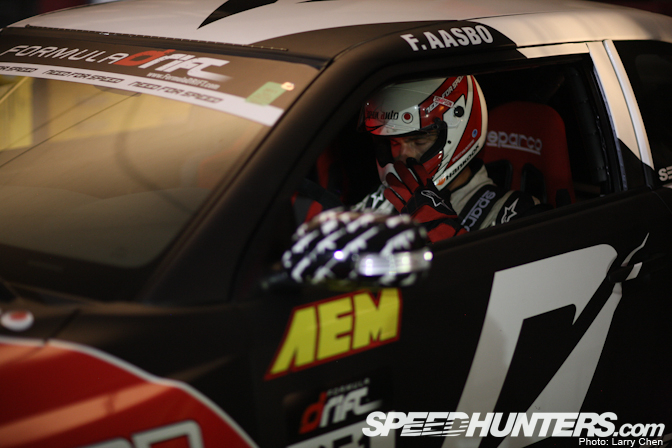 I stuck with him well but with his great lead run I knew I had to put down a good qualification run for my lead. 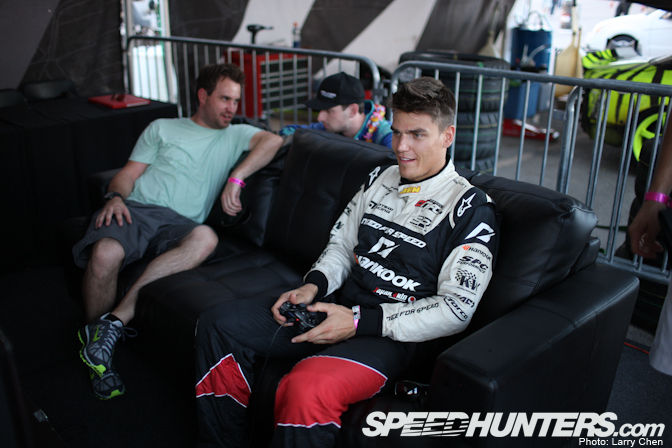 Getting on the radio while heading back to the grid, Steffen further confirmed this. I entered as fast as I could and stuck it on the wide line, in fact I was running a touch too wide. Matt, however, wasn’t as lucky as he carried too much speed and went off course, getting sucked into the tire wall. Matt later told me both him and his car was alright. You can see video of the two runs for yourself here. In short, we were through to the top 16!! YEEEAAAH!! And in top 16, a different Matt awaited our battle… Mattycakes had been ON it throughout the entire weekend, qualifying first in an amazing effort!! I knew we were in for our battle of the day! We have a cool vibe going on in the pits between Matt, his crew and my guys. We were all joking about pouring sugar in each others fuel cell and what not, but it was all in a good spirit. … and I followed suit. I was slightly on his inside, but had good proximity. Matt did a great, fast lead run and I stayed with him leaving room for his transitions and shooting out of the clips slightly on his inside. As I entered the last corner, I put third and the car felt low on power and it didn’t quite pick up the boost like before. We later browsed through the log and the car had started to run very rich, causing a lot of pops and bangs and more importantly being off tune. Steph does some amazing gauging of the car’s parameters, and the fault was later traced down to a sensor starting to go bad. Coming on the radio as we were driving back to the grid, Steffen estimated we were fairly equal for the first battle. Yay, this was it! I was shooting for a fast, committed entry just like I did with Matt Field. It felt like we were flying in there, and Jarod went WOHOOO! You can see the two runs for yourself here. But as we went by the second outer clip, the unthinkable happened. Just like I had experienced in practice, the car wanted to come round on me! In order to not spin, I clutched for so long that I lost most of the speed and shot in on the infield slightly once I had recovered. It was the case of me wanting to bring out that little extra and not having the forgiving car I had in Seattle. 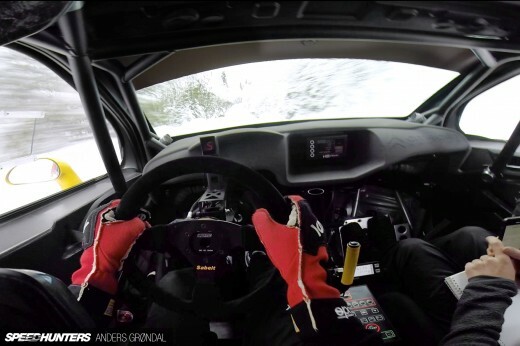 I had driven the car in practice and a better driver would probably have stuck with the commitment level that could be pulled off without half spinning – but I am either not there or I just keep wanting to go so hard. I feel that it’s a combination of both, and I do feel we are on the way to bringing out more potential as we keep learning. Sometimes it doesn’t work out the way we want, but I think that’s when we learn the most. A big congrats go out to Matt and crew for their 3rd place and second podium finish of the year. Much, much deserved, buddy!! On my end, I just woke up at chief Papadakis’ couch after arriving back in SoCal yesterday. 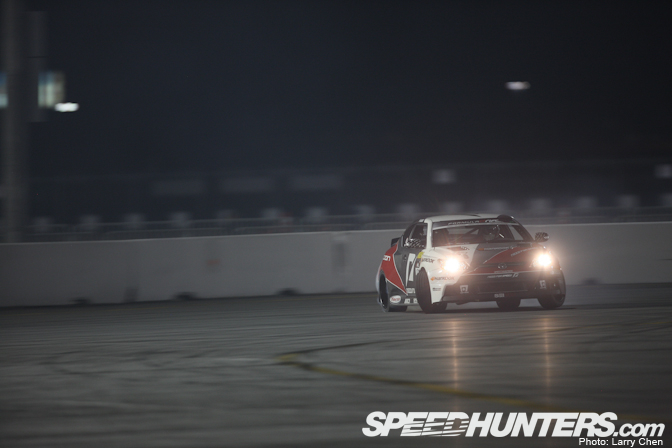 We have had a great Team NFS Euro tour where we ended up winning in the Supra at the legendary Silverstone circuit, and now I can’t wait for the Irwindale finals! 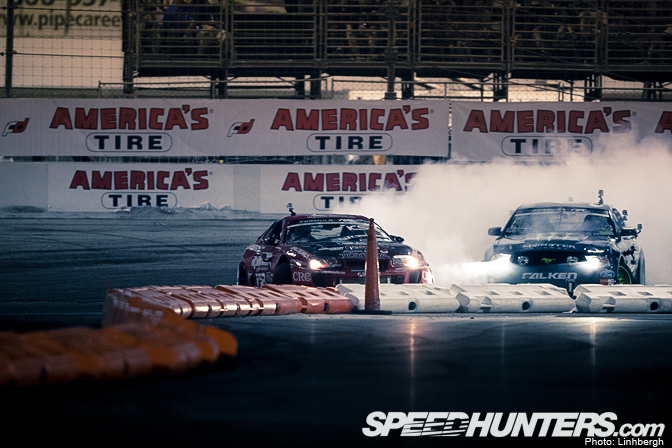 I am already getting goosebumps by thinking of the series finals at the legendary House of Drift. 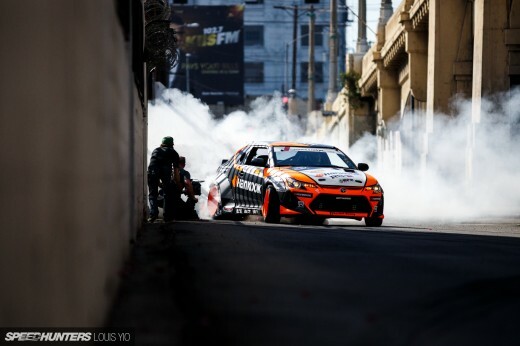 Last year, we were able to clinch the Rookie of the Year title here, and we were also voted to win the Retaks Insane Entry award by the Driftstream viewers. Much, much appreciated – a big, big tanks go out to all of you that have helped giving us a chance to continue competing in FD! My goal is to ultimately be able to drive the entire course on full throttle. I know it will take time before we’re even halfway there, but in my opinion it’s not about where you are right now – it’s about where you are headed. Thanks for your time. I hope to see you all at Irwindale Speedway in less than a month!